Thousands of people took over the streets of Manchester today for the Greater Manchester Marathon. It was the perfect weather for the 26-mile race which started near Old Trafford. 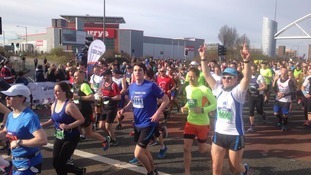 Thousands of spectators have turned out to see around 12,000 runners on the route around Manchester. More than seven and a half thousand people took to the streets of Liverpool today for a marathon with a difference. Large crowds lined the route as the City staged a rock 'n' roll marathon, the first time the event's been held in England. The 2013 Liverpool half marathon takes place in the city today. It's the biggest one since the event began in 1994 with 8400 people will running the 13.1 mile course. Furthest travelled participants are from Brazil, Canada and New Zealand.Most European countries are also represented. Local life-long Wirral runner Eddie Mountford who is now 90 years of age is starting the race. Eddie is now unable to run due to health reasons and the Half Marathon Committee thought it would be very fitting to have him start the race after a long and distinguished career as an amateur runner. The run starts at 9am see the route here. The 26-year-old finished 4th in Beijing four years ago and has missed out on a medal in 3 events so far at London 2012. Today though she finished 2nd in the T54 Marathon race to win a Silver medal. The golden girls from Blackpool are going to make quite a splash at this Sunday's Edinburgh Marathon. All over 50, they started training from scratch 18 months ago. None of them had run seriously before, now they stand on the brink of completing 26.2 gruelling miles. Paul Crone went to meet them.